Lifting and launching a boat is a delicate task. Our team has many years of experience in all aspects of these operations, and works with the utmost precision. A minimum of 3 people are required to ensure the safety of the boat during launching and lifting operations. With our 25T crane and hydraulic cradle trailer, we can move boats of up to 20m with ease inside our buildings. 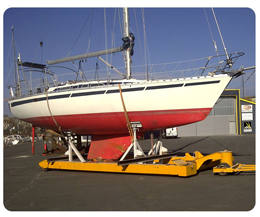 For larger racing and cruising yachts, we arrange for a suitable-sized crane. Transporting a boat by road requires a high degree of logistical expertise and skilled boat lifting. Whether as an abnormal wide load or on a cradle trailer, you can rely on our expertise to get your boat safely to its destination. At just 2 hours from Paris, we are close to major transport networks and easy to reach from the sea. Our location on the English Channel means that our maritime zone is vast, making our facility accessible to all sailors from the Atlantic to the North Sea. We are extremely methodical in order to avoid any incidents.